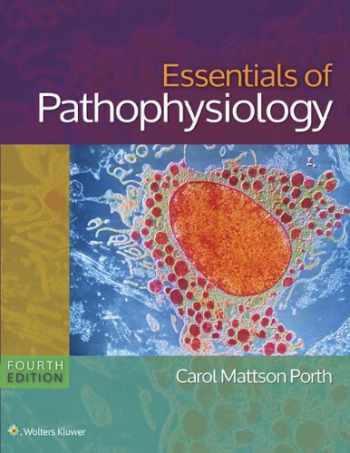 Acknowledged author Carol Porth RN MSN PhD wrote Essentials of Pathophysiology: Concepts of Altered States comprising 1248 pages back in 2014. Textbook and etextbook are published under ISBN 1451190808 and 9781451190809. Since then Essentials of Pathophysiology: Concepts of Altered States textbook received total rating of 4 stars and was available to sell back to BooksRun online for the top buyback price of $27.23 or rent at the marketplace. Prepare your students for their future careers with Essentials of Pathophysiology: Concepts of Altered Health States, 4/e. This clear, readable, and student-friendly text delivers “need to know” disease content, along with the essential foundation in science that nursing, physician assistant, pharmacology, advanced health science, and medical students need to succeed in their future careers. Approaching the topic as an exploration of pathophysiology, the book relates normal body functioning to the physiologic changes that occur as a result of disease and provides concise yet complete coverage of how the body works.The Fourth Edition builds on the book’s extremely successful art program and the “Understanding” feature and incorporates summary concept boxes after each section. In addition, an expanded, robust, and flexible suite of supplements, including a Study Guide, over 40 advanced 3-D animations, PrepU, and Lippincott’s CoursePoint , provide students with all the tools they need to succeed.Student Resources:Learning Objectives for each chapter provide an outline of key content that must be mastered.Journal Articles by chapter, updated for this edition, offer access to current research available in LWW journals.Concepts in Action Animations for every chapter help students master key topics.New! More than 40 Advanced, 3-D Narrated Animations help students master complex pathophysiological concepts.A Spanish-English Audio Glossary provides terms and phrases for communicating with patients in Spanish.Monographs of the most commonly prescribed drugs provide up-to-date information.600 NCLEX-style Review Questions help students improve their test-taking skills and prepare for the NCLEX.A Dosage Calculations Question & Review Question Bank gives students practice in math skills and calculating drug dosages and reinforce key topics of the course.Instructor Resources:PowerPoint presentations make it easy for you to integrate the textbook with your students’ classroom experience, via either handouts or slide shows.Guided Lecture Notes walk you through the chapters, objective by objective, and provide corresponding PowerPoint numbers.Discussion Topics (and suggested answers) can be used as a conversation starter or in online discussion boards.Assignments (and suggested answers) include group, written, clinical, and Web assignments.Case Studies (with related questions and suggested answers) give your students an opportunity to apply their knowledge to a client case similar to what they will encounter in practice.Journal Articles, updated for this edition, offer access to research available in LWW journals.Answers to Review Exercises in the Book are provided for your convenience.Pre-Lecture Quizzes (and answers) are quick, knowledge-based assessments that allow you to check students’ reading.Learning Objectives for each chapter allow you to assess your students’ mastery of key skills.A QSEN Map demonstrates how the text supports QSEN competencies and their relationship to excellent clinical practice.A Sample Syllabus provides guidance for structuring your course.Concepts in Action Animations and Advanced 3-D Narrated Animations are provided to enhance your lectures.To further support your course, the Fourth Edition is accompanied by a Study Guide, PrepU , and new to this edition, Lippincott CoursePoint, a digital curriculum solution that integrates adaptive learning powered by PrepU with access to personalized, perfectly timed remediation built on trusted content. Each product in the suite can be purchased separately or packaged with the main text.